(or rather, of Procol Harum) Address! 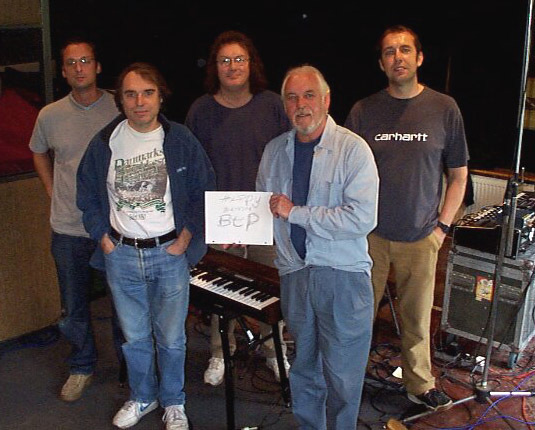 All members of Procol Harum wish the 'Beyond the Pale' website a very Happy Fifth Birthday on 8 October 2002 [see photograph! ], and look forward to its continuance for the next five years. As many fans will know, the idea of a fan website was formed at Procol Harum's Thirtieth Birthday Party at Redhill in July 1997, following a chance conversation between our (now) webmasters, Jens Anders Ravnaas and Roland Clare. It took much work on their part that year for the website to materialise on the internet, and the date of 8 October was chosen for its launch. It seemed appropriate to launch a website in Procol Harum's honour on the anniversary date of the death, and in memory of, one of Procol Harum's most influential members, Barrie James Wilson. The last five years have been very productive for the band. 2000 marked a revival in the band's touring schedule. Following a charity concert with The New London Sinfonia and The Occam Singers in Stoke Park, Guildford in September of that year, a member of the audience, promoter Mark Lundquist, approached the band about the possibility of his seeking concert dates for Procol Harum in the UK and abroad. This resulted in a highly successful European tour in 2001, the band touring in Scandinavia and Eastern Europe and including Russia, performing for two nights at The Kremlin Palace as well as working with the Hallé Orchestra and Hallé Choir at a unique concert at The Bridgewater Hall in Manchester. The webmasters were instrumental in arranging fan gatherings at Procol Harum dates, including Guildford, Kristiansand and Manchester, even forming a tribute band, 'The Palers' Band', to entertain fans who had travelled to see Procol Harum perform. Procol Harum were very touched by the huge distances fans had travelled to see them, from as far as Mexico, the USA, Australia, Peru and all over Europe and Eastern Europe. Many firm friendships have been forged at these gatherings. Gary continued to make new friends and fans while touring the world with Ringo Starr's All-Starr Band and Bill Wyman's Rhythm Kings, featuring heavily on vocals and piano on Rhythm Kings' albums. Gary also played at the Royal Albert Hall and several outdoor concerts at stately homes as a star guest of The British Rock Symphony with Roger Daltrey, Paul Young and Alice Cooper, touring with them in Australia in Spring 2000. He was also Musical Director for the Wintershall Charity Concert in July 2002, featuring Eric Clapton, Sir Bob Geldof, Mike Rutherford, Roger Taylor and a host of other stars. In September 2001 Procol were in Hell, performing at the Hell Blues Festival, followed by a handful of European dates before Christmas; then they were performing again in June 2002 at the Fairfield Halls in Croydon (where another hugely successful Palers' gathering took place), Silkeborg and Copenhagen in Denmark, Katowice in Poland and Bramhall in Cheshire. June 2002, Jubilee Year, and much to the surprise of the band, A Whiter Shade of Pale was voted into the number two position of All Time Favourite Record of the last 50 years in a poll conducted by the BBC: a testimony to the endurance of Procol Harum's music. 2002 also marked the release of a high-quality DVD of the band in performance in Denmark in December 2001 which also featured intimate fly-on-the-wall film of the band in rehearsal at Gary's barn. John Grayson has developed the Shine On merchandise over the past five years; sales are always brisk for anything new, and John was also responsible in assisting in the much-awaited release of Broken Barricades. We would like to thank John for travelling with the band on most of the concert dates and for all the hard work done by himself and Christine. Joining the Procol Harum team this year have been Chris Cooke (management) and Louise Fowkes (marketing and publicity). Thanks also go to Mark Lundquist, the guy responsible for getting the band back out on the road; our valued road crew, Tour Manager Ron Manigley, Sound guy Graham Ewins and Peter (Wee Pete) Keane: and of course to Franky Brooker for putting up with the band while at rehearsals and feeding them too! The band, and also our webmasters, gathered for a very special occasion on 3 May 2002, the wedding of Matthew Fisher to Carol Bellantoni, in Croydon. I was touched and honoured that Carol asked me to be her 'Maid of Honour'. The band has signed a deal with Eagle Rock for a new studio album, recording from 7 October onwards. Recording is expected to take three to four weeks. Release date will hopefully be February 2003. 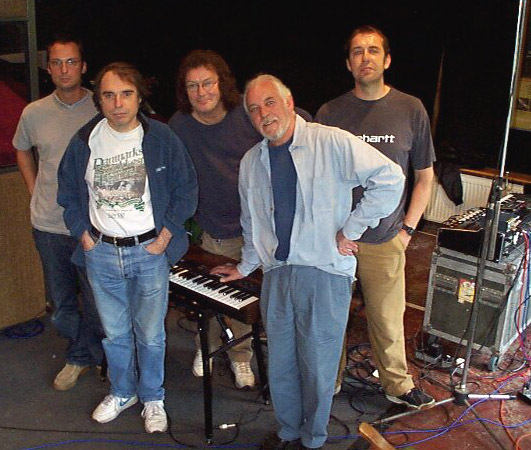 Procol's line up has been constant for the last few years, Gary Brooker - piano/vocals, Matthew Fisher - Hammond organ, Geoff Whitehorn - lead guitar, Mark Brzezicki - drums/percussion and Matt Pegg - bass guitar: and it is this line-up who will be in the studio recording [see photograph!]. Keith Reid has of course written the words for the songs. When the album is released, hopefully in February, keep a careful watch at BtP; promotional dates will follow! So it only remains to give a heartfelt thanks to Jens and Roland: the band - and I'm sure the fans - really do appreciate all the hard work you do. BtP must be one of the very few sites on the internet that is updated daily, and that takes a lot of time and effort. Thanks also to all the fans who contribute to the site to keep it so vibrant. So here's to the next five years! !